A patriotic flower garden can be a great way to show off your national pride, support a military serviceman or servicewoman, or just add decorative flair to your yard or landscaping for summer holidays. With careful steps, your flower garden can be filled with red, white and blue pride for the entire neighborhood to enjoy. While a red, white and blue flower garden can be enjoyed any time from early spring through late fall, these color combinations are more popular for celebrating summer holidays. From Memorial Day in late May through Flag Day (June 14), Independence Day (July 4) and even to Labor Day in early September, a patriotic flower garden can be the perfect decoration. These designs are also popular for summer barbecues, family reunions and other celebrations. Whenever you want your garden to be in its full, colorful bloom, however, be sure to choose suitable flowers with planting times and growth habits that ensure they look their best on the desired date. You can turn an existing flowerbed into a patriotic display or plan an entirely new flower garden to show your patriotic pride. Regardless of which flowerbed you use, there are different factors that should be considered to make sure the bed looks its very best. Any size flower garden can show patriotic colors, but it needs to be carefully designed so all the colors are seen equally. Larger flowerbeds are easier to design colorfully, though it does also depend on where the flower garden is positioned. If the garden is in a very visible space, a smaller garden can be just as delightful as any larger flowerbed. For mini gardens, patriotic plantings may be constructed in a single pot with one thriller, one filler and one spiller plant to give the arrangement balance and movement. Any flowerbed shape can be patriotically designed, whether it is a small, narrow bed, a larger round bed, a spot beneath a tree or alongside a house or fence. A curved bed might lend itself well to a “waving flag” type of design, while a round bed could become a star pattern. Simple color blocking can be used in any bed shape to create a patriotic color scheme. It is important that a patriotic flower garden be visible, not only for your enjoyment, but also for your guests, whether those guests are neighbors passing by your yard, visitors enjoying a barbecue party or anyone else who may see the bed. Properly positioned, the flower garden can be a welcome statement for your yard as well as a focal point for your landscape. There are many beautiful designs for patriotic flower gardens. You could create an image in flowers, such as planning colors and arrangements to mimic an American flag, or you might create star shapes with the different colors. Simply balancing patriotic colors in different tiers can be a lovely option as well. There are many different and beautiful ways to incorporate red, white and blue into a patriotic flower garden, both with plants as well as decorative accents. 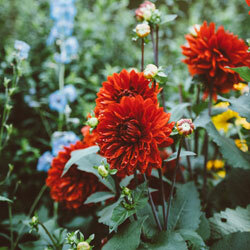 Popular red flowers for a patriotic bed include astilbe, gerbera daisies, cockscomb, dianthus, begonias, dahlias, poppies, camellias, impatiens, geraniums, petunias, salvia and ranunculus. Choose flowers with bold, rich red shades that aren’t too pale or pinkish. Other red accents could include red brick edging, a bright red gazing ball, red hummingbird feeders or even red mulch such as wood chips or lava rock. White stone edging, a short decorative fence or river rocks can frame a patriotic flower bed, and there are many stunning white flowers to fill that bed. Heliotrope, astilbe, petunias, gerbera daisies, jasmine, camellias, peonies, chrysanthemums, yarrow, ranunculus, anemone, vinca, dahlia and hyacinth are just a few options that can add a burst of white to the bed. 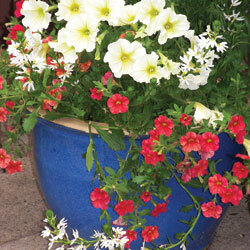 You can also consider red and blue flowers that have white accents in their blooms. 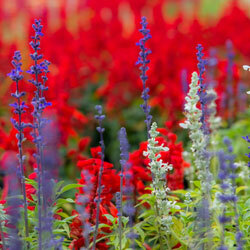 It can be difficult to find blue flowers with the proper rich hue for a patriotic flower garden. Options include cornflower, flax, globe thistles, periwinkle, salvia, harvestbells, desert bluebells, sweetpea and lobelia. To add more blue tones, consider a blue gazing ball, ceramic blue bird bath or blue containers and pots in the proper blue shades rather than having too much purple-like coloration. 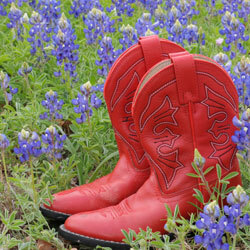 There are many other fun ways to give your flower garden even more patriotic flair. Choose flower types that have star shapes in their blooms or coloration, or opt for big, bold blooms that resemble bursts of fireworks. Adding ornamental grasses to the bed can give it a sense of fireworks as well, or you can go vertical with a colored trellis or arbor, such as a blue structure to support red and white flowers. Add flag stakes to decorate the bed and there will be no mistaking its patriotic nature. To be sure your garden looks its very best right before a party, holiday or other celebration, trim away excess greenery so as much red, white and blue color is exposed as possible. Also trim, prune or pinch away any blooms that have faded or discolored, especially white blooms that may be showing brown edges that can detract from the flowerbed’s beauty. With a little care and attention, your patriotic flower garden will be brimming with colorful spirit all summer long.